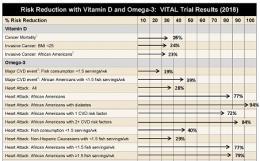 There are newly appreciated associations between vitamin D insufficiency and many other diseases, including tuberculosis, psoriasis, multiple sclerosis, inflammatory bowel disease, type-1 diabetes, high blood pressure, increased heart failure, myopathy, breast and other cancers which are believed to be linked to the non-calcemic actions of the parent vitamin D and its daughter steroid hormone. Based on the evidence we now have at hand, action is urgent. Spyridon Karras , MD, Ph.D.